The next installment in Marvel Studios’ stories arrives this week with Captain America: Civil War. The central (though not only) advisory Cap faces in this movie is Iron Man/Tony Stark, who ends up on the opposite side of the divide when the government wants to regulate superheroes. Captain America and Iron Man were the #4 entry when I ranked Comic Book Rivalries. The new movie also features two characters from Captain America’s long list of villains: Crossbones and Baron Zemo. Both feature in my list of Top Five Captain America Villains. Let’s discuss the biggest foes in Cap’s 75 years history. In the movie universe, Crossbones appeared in Captain America: Winter Soldier played by Frank Grillo as a Hydra-loyal agent of S.H.I.E.L.D. He will appear in Civil War in his full Crossbones costume. Crossbones is newer than many characters on this list, having been created by Mark Gruenewald and Kieron Dwyer in 1989. 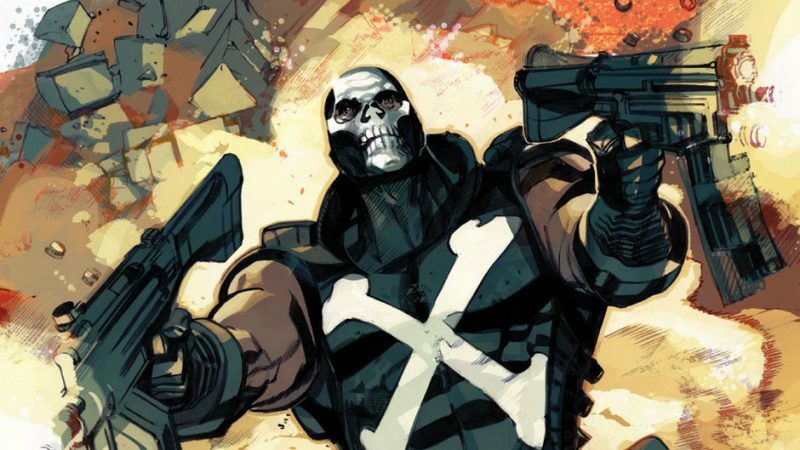 Crossbones has been both the hired gun, having first served under Taskmaster and then Red Skull and Baron Zemo. Crossbones also led the Skeleton Crew under the authority of Red Skull before being kicked out. Crossbones plays an important role in the comic version of Civil War, shooting Cap after he turns himself into authorities (though this isn’t the shot that “killed” Steve Rogers), and it will be interested to see how central his role will be in the film. Zola is perhaps the zaniest comic book design outside of M.O.D.O.K. Zola is a Swiss Nazi scientist who transferred his mind into the body of a robot. That concept isn’t totally unusual, but it’s the character design of robot Zola, by creator Jack Kirby, that makes him so distinctive – the robot only has a small sensor on top of his body and Zola’s face is projected on the robot’s chest. Beyond his robotic weapons, Zola has also a brilliant intellect, especially in biochemistry and genetics. At one point, he created the Hate-Monger, a being with the brain of Adolf Hitler. Zola has occasionally teamed up with the Red Skull, but he has also himself been a major opponent among Captain America villains. When Kevin Feige announced the Marvel Phase Three movies, the “trick” title he used was “Captain America: Serpent Society” (before the ending surprise that the third Cap movie would be Civil War and essentially the fourth Avengers movie). Although the Serpent Society might be a little difficult to pull off tonally on the screen, the group has actually been one of the biggest of Captain America villains. 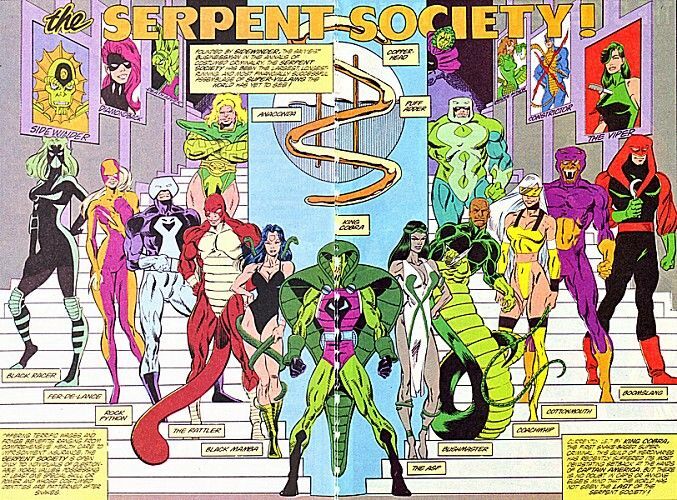 The Serpent Society is an evil super-group made of snake-themed villains. First known as the Serpent Squad in Captain America #163, the original line-up was Viper, Eel and Cobra. The Serpent Squad appeared in Captain America #310 with members Viper II, Eel, Princess Python, Cobra and Krang. Later members included Asp, Bushmaster, Diamondback, Cottonmouth, Constrictor and numerous others. The Serpent Society had its latest iteration in Captain America: Sam Wilson #1 and was called Serpent Solutions. There are actually two Baron Zemos, father and son, and both have been combatants for Captain America. Baron Heinrich Zemo first appeared in a flashback in Avengers #6 in 1964. He was a Nazi scientist who fought Captain America, resulting in his mask permanently stuck to his face. He also is responsible for the apparent death of Bucky Barnes during WWII. Zemo founded the super-group the Masters of Evil as well. During a fight with Cap, Zemo is accidentally killed by a rock-slide. 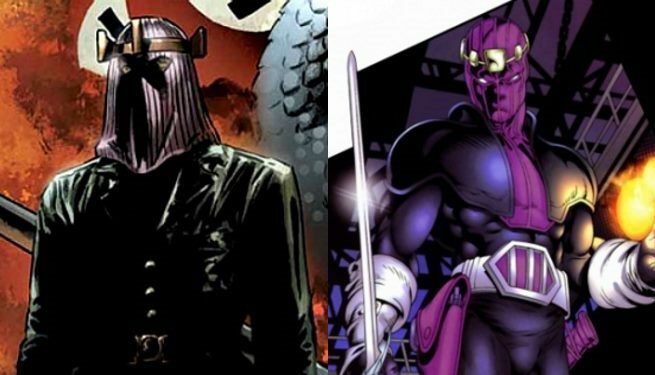 Baron Helmut Zemo, Heinrich’s son, takes up the Baron Zemo name and a similar costume. He sets up to get revenge for his father’s death. 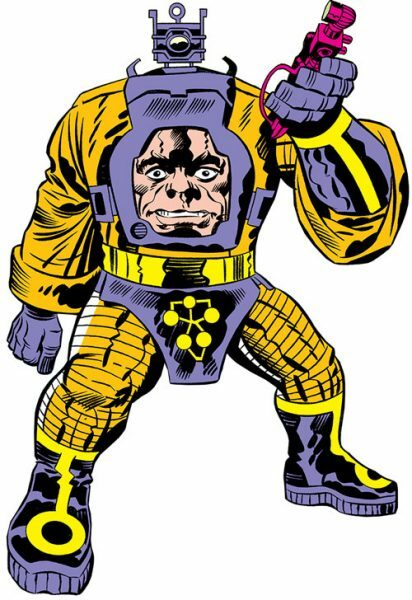 He formed a new version of the Masters of Evil and has teamed up with Arnim Zola on a number of occasions. In Civil War movie, Daniel Brühl plays Baron Helmut Zemo. Legend has it that Joe Simon, the co-creator of Captain America along with Jack Kirby, thought up the design for the Red Skull while eating an ice cream sundae, seeing the cherry in the middle of a mound of ice cream. It’s a funny origin for a wicked character like The Red Skull, whose birth name was Johann Schmidt. The Red Skull has long been the most well-known of Captain America villains, and also one of Marvel’s longtime biggest villains. He first appeared in 1941 in Captain America Comics #7 by Simon and Kirby. In the comics, the Skull is a Nazi under the command of Adolf Hitler. Later, the Skull was resurrected by Arnim Zola. Though there was a period during the late 90s and early 2000s when the Red Skull was not as prominent, he has been a big part of recent Marvel titles and events like Uncanny Avengers, AXIS and the recently-completed Avengers: Standoff! So that is my list of the Top Five Captain America villains. Sorry to the fans of Batroc the Leaper. There are many other great bad guys and gals from the decades of Captain America stories, some lesser known (Scourge) and some more associated with other heroes (M.O.D.O.K. or A.I.M.). Which Cap America villains are your favorites?